After introducing yourself, explain the purpose of this presentation, which is to detail the results of the TIM Performance Measures Focus States Initiative with a goal of determining how you (we) can capitalize on the results and utilize them in your (our) state. "The systematic, planned and coordinated used of human, institutional, mechanical and technical resources to reduce the duration and impact of incidents and improve the safety of motorists, crash victims and incident responders." Source: FHWA Traffic Incident Management (TIM) Handbook (2000). Definition of Traffic Incident Management (TIM). As long as there have been traffic incidents, there has been traffic incident management. The advent of freeways changed how we respond to incidents. Working in a high-speed, high-volume environment is much different than working on an arterial roadway. Concern for both congestion and safety of responders (and travelers, too) in freeway environments has increased the level of coordination and cooperation required in order for the various stakeholders to effectively conduct TIM. Who are the TIM Stakeholders? And of course, our customers, road users. Why is traffic incident management (TIM) so important? Over 43,000 Americans are killed in highway crashes each year. That is the average spectator capacity of some of the largest baseball stadiums in the nation. Traffic crashes claim the lives of more law enforcement personnel than any other cause of death in the line of duty. "Struck-bys" are the 2nd leading cause of accidental law enforcement officer death and account for 20% of on-duty firefighter deaths per year. Effective TIM also reduces the occurrence of secondary crashes. The likelihood of a secondary crash increases by 2.8% for each minute the primary incident continues to be a hazard, increasing the risk to driver and responder lives, and making it even more difficult for responders to get to and from the scene. Faster detection of and response to highway incidents saves lives. Response time has a well-documented relationship to the likelihood of crash survival. Traffic incidents account for approximately 25% of all congestion on U.S. roadways. Every minute of blockage on a freeway travel lane increases delay after the incident is cleared by a factor of four. Idling in traffic costs the U.S. trucking industry over $7.8 billion annually. TIM is scalable. The improved coordination between primary TIM responder agencies (law enforcement, fire/EMS, transportation) for routine, roadside TIM response activities translates to improved coordination for larger incidents and emergencies, both man-made and natural. Improved TIM means better (more efficient) resource management (personnel, equipment, and transportation infrastructure) for public sector agencies. When surveyed on top priorities for the Maryland Department of Transportation, citizens overwhelmingly ranked clearing the road after an incident as the top priority. Maryland's TIM program, CHART, saved Maryland motorists an estimated 6.4 million gallons of fuel in 2005. We all intuitively understand that TIM is important. However, the best way to show its value is to measure it. With so many competing interests for limited public resources, it has become critical to quantify the benefits of TIM to ensure program continuation. With the identification of appropriate performance metrics for TIM, the various stakeholders all assume responsibility for improved performance and accountability. Performance measurement also enables the assessment of coordinated, multi-agency TIM to identify benefits and impacts. The TIM Performance Measures Focus States Initiative identified 11 states considered leaders in TIM programs and in particular in their efforts to track and analyze TIM performance measures. FHWA convened law enforcement and transportation representatives from each of these states in a series of workshops to develop consensus on program-level TIM Performance Measures. Program-level measures are those that cross agencies rather than focusing on the performance of just one responding agency. There are two reasons for this multi-agency involvement in PM. First, both enforcement and transportation agencies (as well as many other agencies) are involved in TIM and collect their own data. These two agencies represent the starting point for multi-agency TIM PM. Second, accurate performance measurement involves the fusion of data from these multiple sources. For example, data about an incident from first report to lane clearance to total clearance exists in at least two databases - transportation and law enforcement. To accurately measure performance, these databases will need to be integrated to include all responder activities, not just those of one agency. The TIM FSI resulted in several accomplishments including valuable peer exchange of innovative approaches to TIM PM, data exchange, and systems integration, institutional models to promote multi-agency information sharing. Perhaps the most significant accomplishment, however, was the consensus-based development of shared definitions for objectives and supporting performance measurement in three core TIM areas central to the NUG and to State and local government priorities: Reducing Roadway Clearance Time, Incident Clearance Time, and Secondary Crashes. These three core PMs directly support NUG Strategy #11: Response and Clearance Time Goals. See: http://www.transportation.org/sites/ntimc/docs/NUG%20Unified%20Goal-Nov07.pdf. The time it takes to clear all incident debris from the scene, including the shoulder. The focus states realized that the first step towards real progress in measuring TIM performance is having everyone use the SAME language to mean the SAME THING. One of the significant accomplishments of the initiative was to begin to use more precise language when discussing TIM performance objectives and measures. Through a series of workshops the Focus States participants agreed to pursue two program-level performance measures, "roadway" clearance time and "incident" clearance time. A third measure, reducing the number of secondary crashes, was also considered by the participants at the final workshop held in October 2007. These are the three proposed national-level TIM program objectives and the supporting performance measures the Focus States agreed to implement in common. The majority of FSI participants are actively implementing or planning to implement the "roadway" and/or "incident" clearance time performance measures. It is significant that the Focus States were able to agree on a shared definition of secondary crashes given the many differing perspectives and variables impacting this area. At the conclusion of the TIM FSI, participants had not yet begun actively measuring this last consensus-based PM. The time between first recordable awareness of an incident (detection/notification/verification) by a responsible agency and first confirmation that all lanes are available for traffic flow. "Roadway" Clearance Time is defined as the time between the first recordable awareness of an incident (detection, notification or verification) by a responding agency and first confirmation that all lanes are available for traffic flow. The time between the first recordable awareness and the time at which the last responder has left the scene. "Incident" Clearance Time is defined as the time between the first recordable awareness of the incident and the time at which the last responder has left the scene. The number of secondary crashes beginning with the time of detection of the primary incident where a collision occurs either a) within the incident scene or b) within the queue, including the opposite direction, resulting from the original incident. "Secondary Crashes" are defined as the number of crashes beginning with the time of detection of the primary incident where the collision occurs either a) within the incident scene or b) within the queue, including the opposite direction, resulting from the original incident. Let's see what the Focus States had to say about why they measure program-level TIM. Potential Incidents Due To Chart Ops. This slide, from FSI participant Maryland, highlights some of the benefits of tracking TIM performance, including reduced incident response, reduced clearance and duration times, reduced fuel consumption and the resulting emissions benefits, reductions in secondary incidents, and reduced risks at primary incident sites. This slide, from FSI participant Wisconsin, identifies the Wisconsin DOT's rationale for tracking TIM performance, allowing for a program performance baseline to be established and progress to be tracked over time. This provides a tool for prioritizing where program resources will need to be expended to improve performance. The Wisconsin program produces a monthly performance measures report that includes a number of metrics, such as: total number of incidents, response and incident clearance time, variable message sign usage report for delivering traveler and incident information, number of freeway service patrol assists, and HOV ramp lane usage. Let's look at some of the results Focus States achieved and some of their experiences with program-level data collection and evaluation. Wisconsin defines "Incident" Clearance Time as the time between awareness of the incident by its Statewide Transportation Operations Center (STOC) in Milwaukee and the time that all involved vehicles and debris are removed from the incident scene, including the shoulder or median. The start-and end-time data are entered into the state's Incident Management System (IMS) database by a STOC operator. The start time data is either CAD data sent from the Milwaukee Sheriff’s Office or incident data observed by the operator on the STOC cameras. Similarly, the end-time data is entered based on operator observation. This slide depicts average incident clearance time for the Wisconsin program throughout 2006 and part of 2007. This slide, from the Florida program, details how the Florida DOT measures incident duration. Florida has been using what the focus states labeled "Roadway" Clearance Time to help measure incident duration. Previously, Florida referred to this as simply "clearance" time. 2 districts are currently able to collect data. Also from the Florida program, this slide details some of the evolution of the TIM PM data collection, starting with manual entry of the timeline data from paper records, which proved to be too time-consuming. The Florida solution was to modify the statewide Transportation Management Center (TMC) software to include data collection and reporting for incident duration. This is a good example of the power of TIM performance tracking. 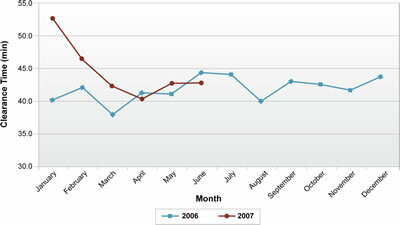 These results, from Florida DOT District 6, show incident duration times for the first six months of 2007, where clearance times have started to increase slightly. While knowing more about the types of incidents may explain the increase in average clearance time, this data provides all incident responders with important feedback on performance. Again, knowing how the performance is trending allows for identification of issues to be resolved and successes (such as reductions in response time) to be acknowledged. This, from Maryland, demonstrates again the value of tracking performance - here demonstrating significant percentage reductions in incident clearance time. Note here that some agencies still use their own language internally ("incident duration") but can link to parallel national performance measure ("Roadway" Clearance Time). The next several slides are from TIM PM FSI participants and illustrate lessons learned and challenges identified through their participation in the Focus States Initiative. The first one, from Florida, points to the importance of automated data collection. Florida challenges included software development/modification to automate data collection, the need to train service patrol operators to assist in the data collection, and, like Wisconsin, challenges with data quality and data availability. Other important lessons learned by the Florida participants include the need to focus on one or two key performance measures rather than trying to capture too many divergent measures. Among the challenges identified by TIM PM FSI participants are these from Wisconsin, which include data quality, an initial lack of standard measures (impacting how operators entered the data) and making the results meaningful to multiple stakeholders. From the Maryland experience, we learn consistent data definitions and data entry are important. Also important is the inclusion of and ongoing participation by the various TIM stakeholders. Obviously there is some great experience among the TIM PM FSI participants and we can and should benefit from their experience. Let's look at what it takes to initiate program-level TIM performance measurement in your (our) state or region. The focus states initiative resulted in several significant lessons that can make it easier for other states to get started with program-level TIM performance measurement. One big thing that we learned, not surprisingly, is that tracking TIM performance measures will require high-level support and buy-in from leadership within participating agencies. This is because doing any sort of performance measurement in general requires some investment of time, and this may require a shift in priorities and/or additional resources (people and/or equipment) to accommodate this initially. Note, however, that over time, states that are regularly performing program-level TIM performance measurement have reported success in winning additional resources to support TIM because they are demonstrating the value of TIM as well as accountability and commitment to results among the agencies. Performance measurement may also require system/software modifications as well as interagency agreements to collect and track data and changes in operational practices. The final bullet is called an "investment" because it is not a sunk cost - it is indeed an investment that pays off in the long run. Send an email to TIMPM@dot.gov to subscribe! The good news is, a number of resources are already available to assist in getting started with TIM performance measures. 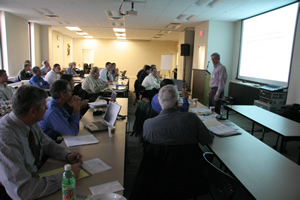 At the request of the 11 participating Focus States, FHWA has developed a knowledge management system to allow the Focus States and others interested in TIM performance measurement to continue to share information, experiences, and resources, such as data exchange standards and architectures, with each other. This system comprises a managed email list (like a LISTSERV) to allow folks to tap into the collective knowledge across the country with TIM performance measurement as well as an online Knowledgebase for convenient sharing of documents and other downloadable products. A one-page fact sheet on the TIM Performance Measures Focus States Initiative gives a high-level overview of the program and its benefits that can be used with key decisionmakers in your organizations. The workshop reports give more detailed information on how the Focus States got started in their data collection and analysis and the lessons they learned. A contact list of TIM PM Focus States participants is available so that you can contact them directly for more information. FHWA's annual TIM Self-Assessment is another useful tool for identifying TIM performance measures and tracking those measures on a yearly basis.